Pierson "Bud" Apol, age 93, of Grand Rapids, went to be with his Lord on Friday, October 12, 2018. Bud proudly served his country in the Army during WWII. 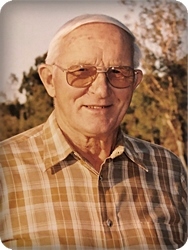 He will be lovingly remembered by his wife of 63 years, LaVonne; children, Janice (Dr. Mark) McCormick, Ellen (Dr. Richard) Juhnke, James (Jane) Apol, Robert Apol; 11 grandchildren; sisters, Kathryn Bronsink, Grace (Ed) Morren; sisters-in-law, Arlene Muilenberg, Phyllis (Robert) Ellis; brother-in-law, Kenneth (Donnivee) Muilenberg. Visitation will be held from 2 - 5 pm on Sunday, October 14 at Stroo Funeral Home. The funeral service will be held 11 am Monday, October 15, at Covenant Christian Reformed Church, 7171 Willard Ave. SE with Rev. Curt Walters officiating. There will be an hour of visitation prior to the service. Interment will be in Blain Cemetery. Memorial contributions may be made to Holland Home Resident's Assistance Fund or Faith Hospice.